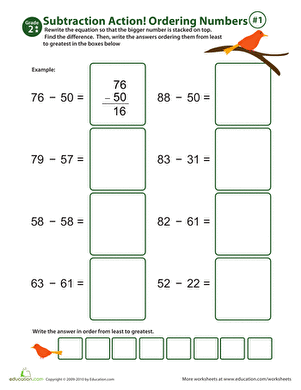 Let the pretty bird perched at the top of this adorable ordering numbers worksheet be your students' guide. 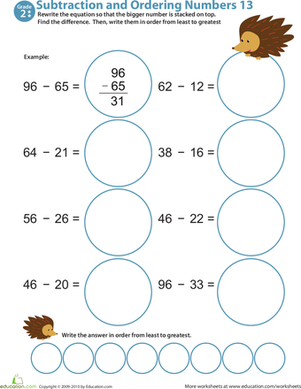 As they work through these seven double-digit subtraction problems, they'll boost their understanding of an important concept and practice their mental math skills. 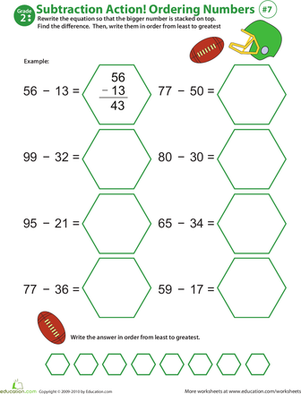 At the end, there's an extra educational bonus: an exercise in ordering numbers the answers from least to greatest! 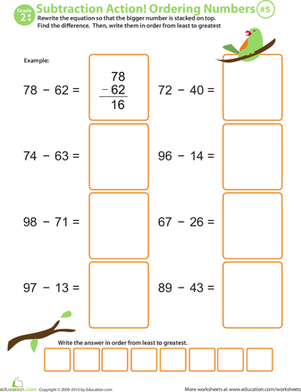 Check out the rest of the worksheets in this series for more practice. 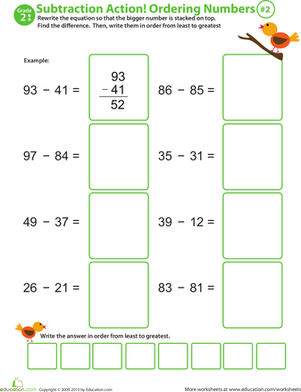 Incorporate both double-digit subtraction and ordering numbers into just one colorful worksheet! 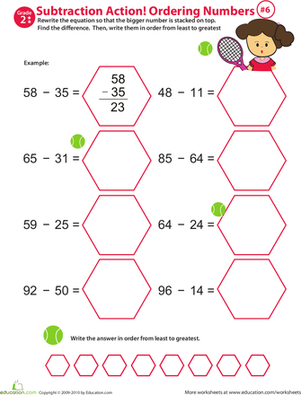 Your second grader will be challenged to solve double-digit subtraction and practice ordering numbers in this tennis-themed worksheet! 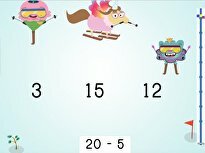 She'll boost her subtraction skills as she practices ordering numbers. 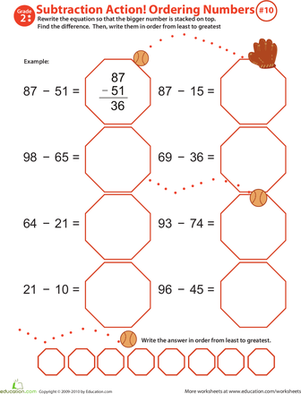 This worksheet is a double whammy; your second grader will practice double-digit subtraction and work on ordering numbers from least to greatest. 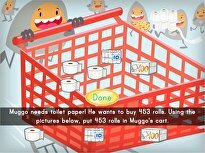 He'll learn subtraction and practice ordering numbers from least to greatest. 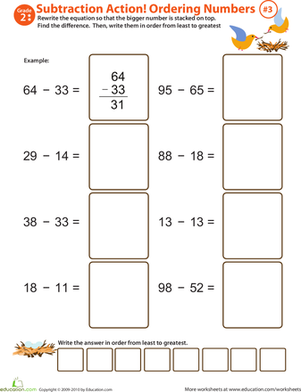 Get your child excited about subtraction with this 2nd grade math worksheet in which she'll practicing writing equations, subtracting, and ordering numbers. 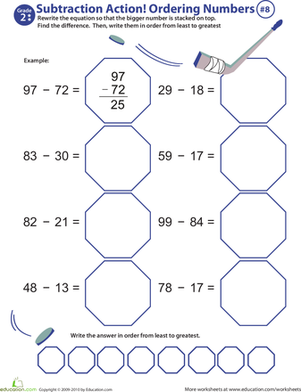 Maximize your second grader's at-home math practice with this fun worksheet, which combines subtraction and number ordering. 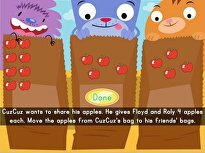 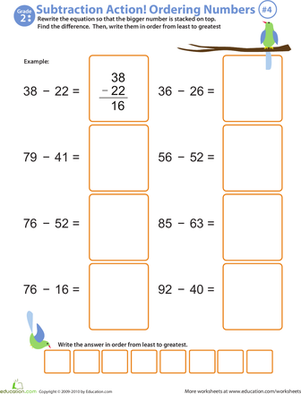 Help your child improve his subtraction facts fluency with this 2nd grade math worksheets featuring two-digit subtraction and number ordering. 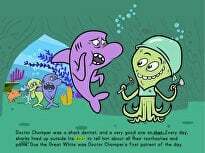 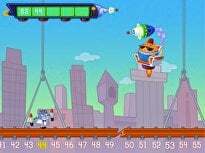 Offers two-digit subtraction and a number ordering exercise. 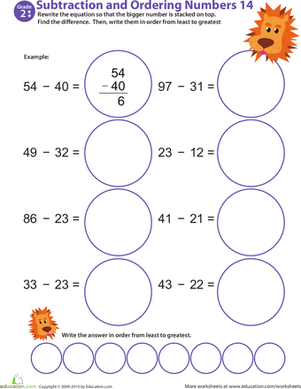 This colorful worksheet will help your second grader enhance her double-digit subtraction skills and ability to order numbers from least to greatest.